Even if you aren't one for trends, there are still plenty of super cute styles that fit the "new year, new do" mantra everyone is throwing around right now. Need some inspiration? Click here. Before you go off dismissing me, telling me that it takes too much time, energy, and effort to detangle your hair thoroughly, and that you'd lose 87% of your hair if you did things the right way, just hear me out for a second. First, let's clarify that by thoroughly, I mean as detangled as possible for your particular head of hair. For someone like me, that means my hair is about 80 - 90% tangle-free on any given wash day. Second, I by no means think that having all the time tangle-free hair is realistic. Natural hair is never going to be 100% tangle free - our curls, kinks, and coils, like to clump and frizz together, because they love each other so much. Third, I don't mean that you have to do this every single time you detangle (unless you want to). Do it with a frequency that works best for your hair and your time schedule. I wash my hair about two times a week, and I detangle thoroughly first every time. Otherwise, I'm setting myself up for a shower nightmare. The point here, is to just do it. Detangling thoroughly will help cut down on breakage, knots, matting, and even lend itself to better styling results in some cases. 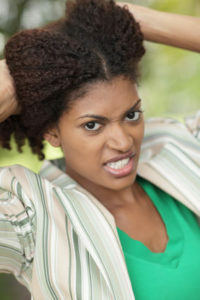 As far as detangling the right way, that is also completely based upon your hair's needs. I personally like to detangle using water, and either Suave Professionals Almond and Shea Conditioner or Soultanicals Mango Dip Detangling Slip. I saturate my hair with water and product, and go to work with my fingers in 5 sections before taking it to the shower to cleanse. That works for me and my hair. If dry finger detangling with coconut oil works for you, or you have a concoction and comb that does your hair right, then by all means stick with what works! However, if you're losing mountains of hair (and a significant amount is breakage), you may want to re-evaluate how you're detangling your hair, and what you're detangling with. Commit to doing better by your detangling sessions in 2014, and watch your hair thrive! Since August of last year, I have been on a mission to support, promote, and spread the word about great natural hair small businesses. Many of them have been featured on my blog, and here on BGLH. In truth, this personal movement began after I wrote an article in which I researched many relaxer product brands that had attempted to launch natural hair product lines. The general consensus among readers is that we ain't buying it. As it stands, I am currently on a mission to support at least 1 natural hair small business every month. I do understand that it can be terribly inconvenient to wait for products to arrive at your doorstep (especially when I need it ASAP), pay shipping, and often pay a little more for a product than you normally would from Target or Wal-Mart. But I encourage every natural and transitioner to find at least one small business to support one time this year. Through writing these small business features, I have gotten to know a number of the owners and discovered that they are sweet, determined, goal-oriented, natural hair-loving, ingredient researching, entrepreneurial Black women and men, with a vision for better hair care. These small business owners truly care about healthy natural hair, and it shows in their ingredient choices and products offered. Looking for somewhere to start? Click here. As I have more and more fun with my new natural hair, I've discovered that I needed to make a few adjustments to the regimen that I used as a transitioner. The first such change was to focus on sealing my ends more. The second change, which had the biggest impact on my hair, was deep conditioning more often. Instead of doing a monthly or biweekly deep conditioning treatment, I aim to do one at least every week - if not twice a week. Since making this adjustment, I have seen less breakage, less difficult tangles (you know, the kind that force you to break out the scissors), practically no split ends (although I do understand part of that has to do with chopping my hair a month ago), and retaining moisture in my hair has been super easy. You don't have to deep condition overnight or for hours on end to receive these benefits. Deep conditioning 20 or 30 minutes with or without heat is plenty of time for your hair to absorb what it needs, and for the ingredients that condition the hair to do their magic. Looking for a good deep conditioner? I'm always on the prowl, and I have sort of a thing for deep conditioners. I do. Deep conditioners and curl definers drive 85% of my product junkie-ism. You can kill two birds with one stone, by checking out these small business deep conditioners: tgin Honey Miracle Mask or Triple Moisture Replenishing Conditioner, Koils By Nature Ultra Moisturizing Cocoaloe Deep Conditioner, Camille Rose Naturals Algae Renew Deep Conditioner, Darcy's Botanicals Pumpkin Seed Conditioner, Curl Ecstasy Hair Tea, All Things O' Natural Natty Cupuacu & Rhassoul Deep Conditioner, Karen's Body Beautiful Luscious Locks Hair Mask, or Shescentit Riche Moisture Masque. Warning: moment of complete honesty and transparency coming. There are some days when I get on Instagram or browse natural hair websites and go into side-eye/eye rolling autopilot. Not because folks post pictures of the same people (although admittedly, I do get a little tired of that), but because of the comments that follow as a result. I can't wait for my hair to look like this! Omg, you are so lucky to have xyz texture, I could never do that with my hair! Look at that length! I want my hair like that now! So jelly! I hate my hair! Which takes me to my next point. Perhaps this should be another resolution all to itself, but for the sake of simplicity (because the two points are closely related), I'll keep them together. I am ever so tired of the texture wars. All textures are beautiful. Kinks are no better than curls. There is no coil hierarchy, besides the one that you buy into and impose upon yourself. I don't care who propagates what images, or what hair models a brand uses to promote their products. If you don't like what you see, don't support it. I'm tired of the arguments about certain hair types being promoted above others. Changing our hair means nothing if we have not changed our thinking. All textures and types of natural hair are to be celebrated, and it is important to understand that even within our collective community there is diversity. And that diversity in and of itself is beautiful, and what makes natural hair so dope. So please, let this one go for 2014. Are there any natural hair resolutions you're making for 2014? Share!